Koehler was hurled headlong flaming from the ethereal sky. This is his first offering for the ESP Institute. Side A recalls the hazy memory of an ear-worm chant heard over a decade ago on the streets of Thailand, a melody that since haunted the artist and has finally been exorcised by his own hand in the shape of 'Melencolia V'. 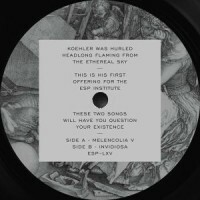 Somewhere between an enchanted bashment and a sailor’s watering hole, Koehler found a gargantuan kick drum that lands solely on the 4, slammed it together with a wide pulsing bassline and brutalized dancehall snare, then laced it all up with his elusive synth melody. Add to this a generous sprinkle of finely-ground cosmic dust and we’re all tripping the light fantastic. On the flip side, the artist buckles up for a rough and rapid-paced journey with 'Invidiosa' — a relentless snare scrapes, gouges and corrodes over 7 minutes, coupling with a simplistic bass loop and swiftly marauding through a demented assembly line, accumulating various nuts and bolts of instrumentation along the way — an undeniable dancefloor exciter for those hours when the club becomes unhinged, dancing becomes raving, and slightly more audacious folk can channel their inner truth. These two songs will have you question your existence.